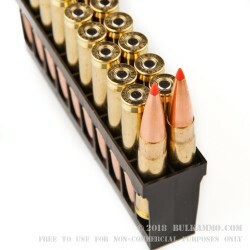 Looking for a high performance .300 Blackout round for your next shooting match or day of wowing friends at the range? 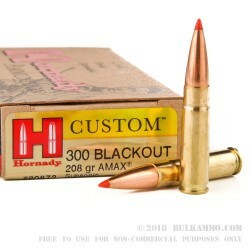 Hornady’s Custom Line of .300 AAC Blackout ammunition features a 208-grain A-Max match round projectile. The A-Max projectile features an ultralow drag tip that offers better stability in flight, a Secant Oglive profile which allows for a flatter shooting and a more accurate projectile. The swaged lead core and AMP jacket make for rounds that are extremely uniform, creating a consistent shooting round box to box. All of this, in conjunction with the boat-tail design, make the A-Max bullet one of the most accurate projectiles available for match shooting. 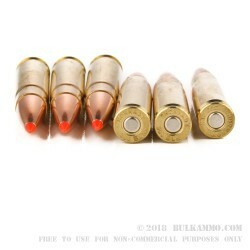 These rounds are loaded into a boxer-primed, noncorrosive, reloadable brass cases and come 20 rounds to a box. Using only the highest quality components for their casings and bullets, Hornady’s goal is to create a more accurate, reliable round, no matter the situation. 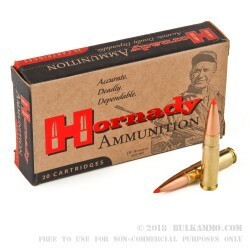 Since 1949, American-made Hornady has created high-performing reloading supplies and ammunition in their Nebraska facility, forging a reputation for quality, American-made ammunition.